The ring in the HHOF display belonged to William "Billy" Barlow, who was a member of the Montreal Hockey Club (MHC). The ring pictured above is another one from the same set presented to player “G.S. Low”. In 2009 it auctioned for more than $55,000, a price no doubt inflated by the idea that the Low and Barlow rings are “Stanley Cup rings” (see also here and here). Since there was no actual Stanley Cup competition in 1893, it seems a little early to be awarding rings. And the next ring in the HHOF display is from 1961, so the early one appears to be an outlier. What evidence is there that these 1893 rings should be considered “Stanley Cup rings”? The Stanley Cup story begins in March 1892 , when vice-regal aide Lord Kilcoursie announced that Governor General Lord Stanley wished to donate a challenge cup for the hockey championship of the Dominion of Canada. He and his family had been taken with the game and wanted to encourage play, especially between the Quebec and Ontario leagues that had Ottawa at their nexus. Over the next year a suitable cup was procured and engraved in London, England, and it arrived in Ottawa in the spring of 1893. Philip Dansken Ross, noted hockey player and Ottawa Journal publisher, was one of two trustees given the task of governing the cup, and on Sunday 23 April “P.D.” sat down to draft the new rules, which were printed in his paper on the 1st of May 1893. Excerpt from the Evening Journal (Ottawa), 1 May 1893, page 5. The MAAA (Montreal Amateur Athletic Association) team that was being specified was actually the MHC, which was technically just an “affiliated club” of the MAAA. The difference between an MAAA club team and an affiliate was subtle, but one that clearly mattered to the MHC men and this would soon lead to difficulties getting the Cup presented. Oblivious to the potential for slights, over the next few weeks it was arranged for the other Stanley Cup trustee, Sheriff John Sweetland, to travel to Montreal to present the trophy to the MAAA. When he arrived at the annual meeting on 15 May he was probably quite surprised to discover the MHC’s executives had declined to attend the ceremony. The MHC members were apparently annoyed that the Cup was to be presented to them through the MAAA—and that the Cup had already been engraved with “MAAA” and not “MHC”. To make a long story short, it was only after a year of negotiations and another AHAC championship that the MHC finally agreed to take possession of the Cup. After they did, they had it engraved “Montreal 1894”–there was no reference to the MAAA. So, what about those rings? 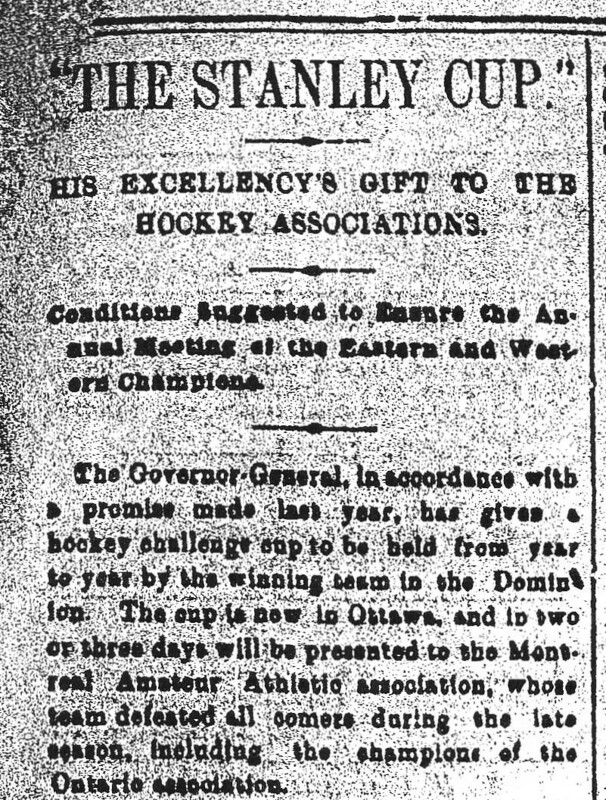 Proposals were gathered, and at the next MAAA board meeting on 1 May 1893 it was “unanimously decided to accept the ‘Ring’ design.” (Notice that this meeting took place the same day in as the rules for the awarding of the new Stanley Cup were announced in the pages of the Ottawa Journal and The Gazette in Montreal.) The rings were ready in time for the 15 May annual meeting two weeks later, when Sweetland showed up with the Cup. Extract from of 15 May 1893 annual meeting, page 315, MAAA Minute-book, Montreal Amateur Athletic Association fonds (MG28 I 351), Library and Archives Canada. Curiously, the minutes of the 15 May meeting do not mention the rings at all (pages 315-316/image 213). However, a newspaper article about the meeting in The Gazette (partially transcribed here) noted that “souvenir rings” were presented at the meeting to celebrate “the championship for seven [sic] years in succession.” (The rationale for the reference to seven years of championships, not six, is not clear.) Paul Kitchen refers to another source, presumably the Montreal Daily Herald, that notes MHC captain Tom Paton was also given a Heintzman piano, a gift that would have been worth several hundred dollars. Although the presentations of Cup and rings were planned for the same night, there is no mention of a connection between them, and in fact they were being given for two related, but different things. The Cup was being given to the 1893 AHAC champions; the rings were being given to the six-time AHAC champions. Nor do the two rings that we know about today (of the nine that appear to have been produced) make a material link to the Cup—both are engraved with “Champion 1888—1893” to acknowledge the six consecutive AHAC championships won by the club, but there is no mention of the Stanley Cup. While it is possible that the MAAA could have had advance notice of the awarding of the Cup to the MHC and factored that into the decision to award gifts to the players on 24 April, P.D. Ross had only drafted the rules the day before, and there is no evidence he immediately conveyed the decision to present the Cup to the MAAA. And even if it had been widely understood (for weeks or even months) that the MHC were to be the first Cup holders, the MAAA did not take the opportunity to engrave this information on the rings. Admittedly there was not a lot of space to do so, but there is also no record of explicit verbal or written evidence that notes any connection between the rings and the Cup. The most plausible explanation is that there was no relationship and that the rings were solely a prize for the truly significant accomplishment, which was the six (“seven”) consecutive AHAC championships. Though the Stanley Cup was a prestigious trophy recently donated by the governor general, it was new and had not been “won” in the conventional sense. It would become the dominant national hockey competition in the years to come, but in May 1893 it was not yet something that would likely have justified a set of gold rings (which cost almost double the value of the trophy itself). The most telling aspect is that the rings were a one-off event, and no lasting tradition was created. (This makes sense if they were only for the six-time championship recognition). In fact, no rings explicitly for a Stanley Cup win appear to have been made until well into the 20th century. In the 1920s, baseball and football began producing rings for their champions, and the NHL-era Cup rings that we see seem to come well after that. This absence of a continuing Stanley Cup ring tradition is what most clearly communicates that the appearance of these AHAC championship rings and the Stanley Cup in the same month of 1893 was at best just a happy coincidence. The following account is based on primary source research and Paul Kitchen’s “They Refused the Stanley Cup,” although I should note that Kitchen implicitly accepts that they are Stanley Cup rings. By taking the 1894 AHAC championship the MHC had become the first “winner” of the Cup (as opposed to its first holder). In March 1895, they also became the first winners of a challenge series (as defenders), but had to immediately turn over the Cup to Montreal Victorias, who had become that season’s AHAC champion. Yes, it was a little complicated. Digitized from the MAAA fonds held at Library and Archives Canada. Though it is not clear when and where the rings were accepted by the players, there is no evidence they were refused, which might have been the case had there been a Cup connection. 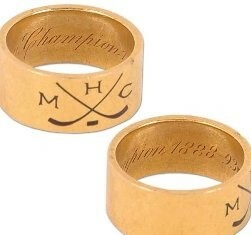 On the other hand, the rings were engraved “MHC”, not “MAAA”. J. Andrew Ross is an archivist at Library and Archives Canada and the author of Joining the Clubs The Business of the National Hockey League to 1945.